A nurse at Primary Children’s Hospital, Kate Dowden, known as Nurse Kate, was diagnosed with cancer in 2010, which led her to embrace a whole, plant-based food diet that aided in her recovery. 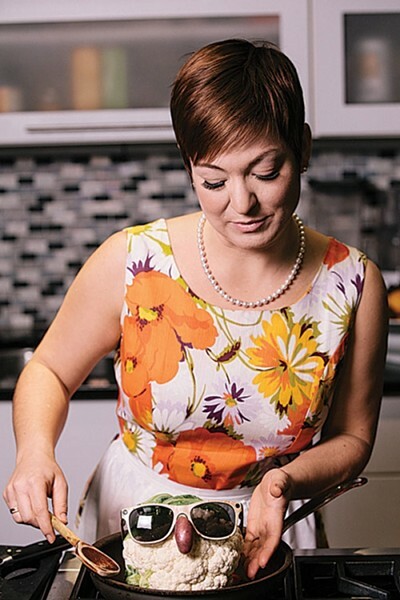 She received the plant-based nutrition certification through Cornell University and decided to start a business to teach the whole, plant-based food lifestyle. Resilient Body Nutrition—which she started in October 2013—aims to teach the lifestyle in an intimate, collaborative way, with a six-week immersion course as its featured service. Nurse Kate offers cooking courses, catered lectures and even house parties. Learn more or sign up for services at ResilientBodyNutrition.com. How did having cancer lead you to start looking into nutrition? What is whole, plant-based food? Whole, plant-based food means as close to nature as possible, so really minimally processed. It includes things like whole grains, legumes, beans, fruits and vegetables, nuts and seeds, in as close to their natural form as possible. It’s not vegan. One food that’s vegan that is a great example of why I don’t use the word vegan is Oreos. Oreos are a totally vegan food and they are outrageously horrible for you. They’re really processed and have a lot of hydrogenated oils; they’re not healthy. So it’s less of an emphasis on strictly no animal products than that they are as close to their natural form as they can be. How did eating plant-based foods affect your cancer recovery? I lost about 20 pounds. I’ve kept it off—my weight hasn’t wavered by more than a pound or two in two years and I feel better. I have more energy. I feel good. I love cooking. And more importantly, it makes me feel like I have control over my disease, even if I’m decreasing my risk by just a little bit. I wish I had found this out before I started chemo because so many of these foods are so mild and so nourishing and so easy that I wish I would have been eating this way through chemo. I think it really would have helped me feel better, ‘cause it certainly helped me through my recovery process. Can you cure cancer by just changing your diet? Nutritional science is a very hard nut to crack. I don’t make any claims as to curing any diseases. I think any specific diet that does make claims like that, you really need to think about their motives. This diet has been linked very well with decreasing risk. It’s really hard to say that this specific diet does this specific thing and all we can do really is make educated assumptions based on patterns that we see in human populations. There’s been a lot of study done in the nutritional realm regarding, you know, is one diet better than another. But you can’t take a baby from birth, follow him for 30 years, put him on a vegan diet, put another one on a plant-based diet, put another one on a Paleo diet and monitor everything they eat. That’s an outrageous endeavor to try and do it in a true scientific way. That’s why there’s so much conflicting information. The cancer-specific portion of a whole plant-based diet is pretty well researched but very controversial. In 1956, they passed the Delaney Amendment, which was the Food & Drug Administration’s kind of answer to all these carcinogens in our environment. They set up these guidelines like, does this product cause cancer in laboratory animals? Does increased exposure cause increased tumor formation? Things like that. And if you look at just casein, which is the protein in dairy, that is one nutrient, one protein, one animal protein that has been extremely well-studied. This research showed increased exposure to casein causes increased tumor formation. They went so far as to put these mice and rats on a 20 percent diet of casein and then turned it down to a 5 percent diet of casein. They showed without a doubt that the more of this protein you take, the more tumors are formed in the presence of a carcinogen. Would you call RBN a diet? Why would you suggest this over the Paleo diet, for example? The Paleo diet gets a lot of things right. Their emphasis on whole, unprocessed food is awesome. And it’s one of the few fad diets out there—and make no mistake about it, it is a fad diet—where there’s a lot of good things that they’re saying to do. But carbs are good for you. There is a lot of science to back that up. I don’t agree in limiting healthful, whole-food carbs and there are some big ideas in the Paleo diet that I just can’t get on board with. Has this diet been checked out by doctors? There’s a ton of physicians that are on board with this style of eating. It’s a very safe way to eat. We’re not asking people to eat super high-protein diets, which have been linked with increased cardiovascular disease and all kinds of renal and kidney issues. This is a very, very safe diet. What makes RBN not a fad diet? The way I’m teaching it is to do it strictly for six weeks and then you make your own choice. It’s not a fad diet because I’m hoping to add education and skills like cooking and picking out food and stuff like that that you can then incorporate into whatever you feel is the best diet for you. I don’t expect people to be as strict as I am with my diet—that’s everyone’s personal choice. But once they know the benefits of a whole-food, plant-based diet and have the skills on how to do that, then, yeah, you’re gonna incorporate those. You’re gonna put those into your cooking quiver and pull them out as you see fit. What about choosing a diet that takes animal products in moderation? The issue I have with the idea of moderation is that your idea of moderation and my idea of moderation will be very, very different. Someone’s idea of moderation could be cheese 37 times a week instead of 57 times a week, whereas my idea of cheese in moderation is maybe twice a year. On your website, you mention avoiding oils. What’s bad about oils? Oils is a good thing to talk about. In my course, we very strictly limit oil and the reason for that is two-fold. One, fat and oil are extremely addictive. It’s the same neural pathways as sugar, heroine and cocaine. It hits on those pleasure centers in the brain. And that’s a very difficult cycle to break. And you don’t stop by eating less, you stop by stopping. In order to break that cycle and really feel what it’s like to taste food without oil, we have to stop for a certain amount of time. Ideally, you’d stop forever. Again, I eat very little oil. I almost never cook with oil. But it’s hard to avoid all the time. Was it hard to make the switch to eating whole foods? My experience with it to begin with was pretty comical, but I noticed right away. There’s this phenomenon that happens where if you’re eating high-oil foods and animal products, when you stop, everything tastes kind of bland. And so everything tasted bland for like a week, and then I started to reset those taste receptors and it was like the world exploded into flavor. My eyes were rolling back in my head as I’m eating some pineapple or a perfect avocado. I’m a huge foodie and I love to cook. That joy came back. I’d been counting calories and stuff, which made me so angry. And this I could eat as much as I wanted. I didn’t expect this, but I felt very free. I felt like I could eat whatever I want as long as it was a whole, plant-based food. I was never hungry and it really was so liberating in ways. Does changing to a plant-based diet mean more time cooking and less opportunity to eat out? That really was hard to adapt to, and that’s one of the big pushers for me to create this course; it is a learned skill. Eating whole, plant-based food doesn’t need to be harder, it doesn’t need to be more expensive, it doesn’t need to take more time in the kitchen. But learning those workarounds is a skill. You don’t need talent to cook, it’s just a set of skills. And once you break that down just like any other set of skills anyone can learn it. You can still eat out; you just have to either choose places that lend themselves more to vegetarian food. Thai food, Vietnamese, a lot of Asian cuisine is really plant-based. We are so lucky in SLC; we have a ton of plant-based restaurants: Zest, Frisch, Sage’s, Vertical Diner.